In my last two presentations, I talked about the large-scale aspects of the planetary geology of the Moon, and the kinds of surface features we can observe through amateur telescopes that allow us to understand how the surface of the Moon came to look the way it does. Obviously, this meant focusing on the visible side of the Moon, and I pointed out the two principal features we can see, apart from the heavily cratered terrain : light coloured highlands and dark coloured lunar Mare, or “Seas”. I explained that the light coloured material formed when crystals of the lightweight mineral feldspar floated to the top of a Moon-wide magma ocean, and that the dark material formed 3 billion years ago when basalt lavas erupted into the giant Basins that had formed by large impacts about a billion years previously. ​However, there’s something fundamental that’s missing from my story : just look at these images and you’ll immediately see what I’m getting at. On the near-side of the Moon, the side we can see, there are large patches of Mare basalt, some of which are clearly ringed by the Highlands thrown up by forces generated by the giant collisions that formed huge impact Basins some 4 billion years ago. if you remember, the dark Mare basalts were erupted some 1 billion years later when the heat generated by the breakdown of radioactive elements inside the Moon finally produced widespread melting of the Moon’s interior about 3 billion years ago. 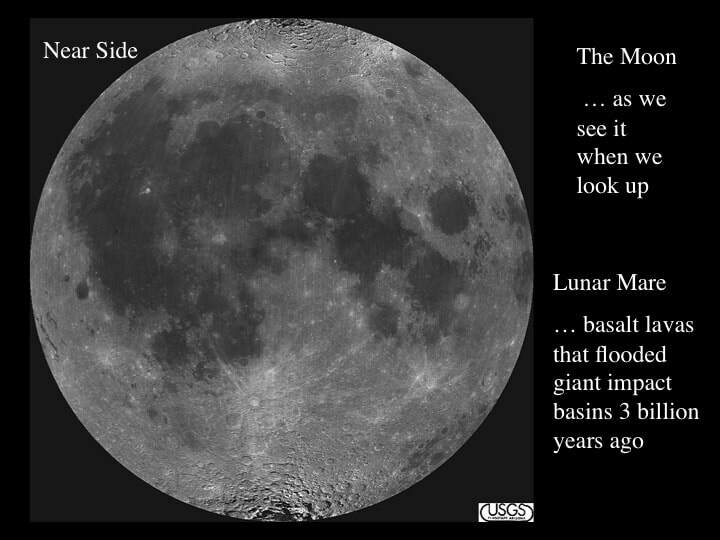 But what about the far-side of the Moon … where are the huge “Seas” of 3 billion year old basalt lava? The simple answer is - except for the South Pole-Aitken Basin - they’re not there ! 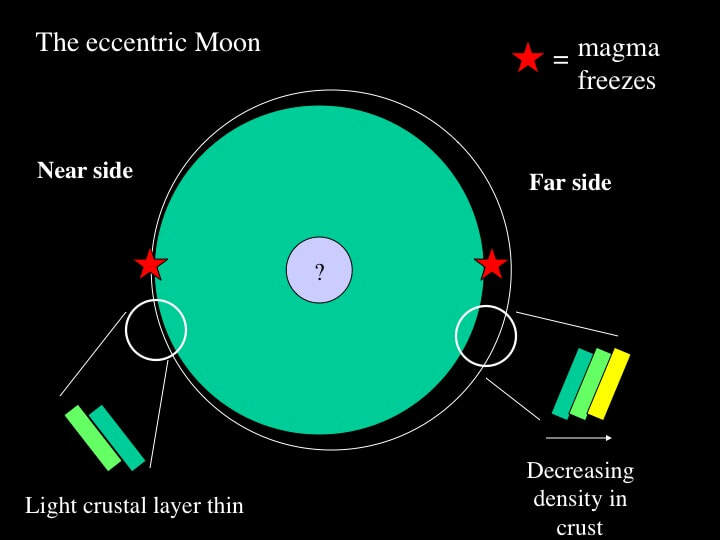 So, the question here is, can lunar geology tell us why the Mare are all on one side of the Moon, and more especially, what are they doing mostly on our side ? 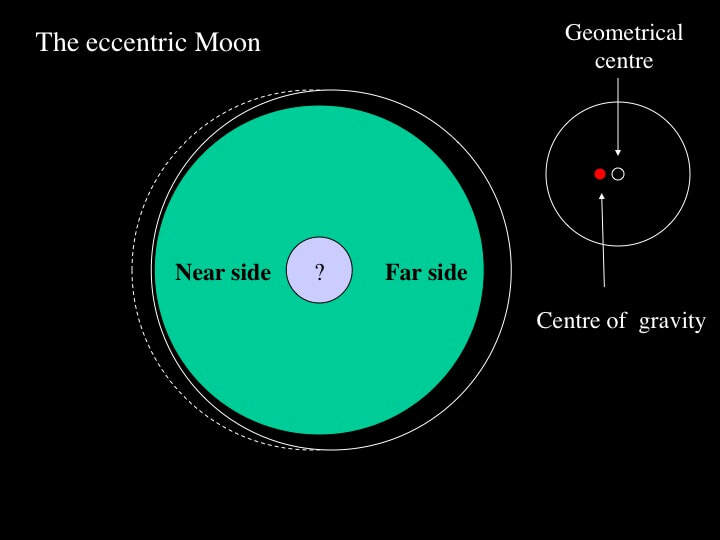 Let’s start with a simple observation : not only is the Moon asymmetrical on the surface, but - and this is one of the most surprising things about the Moon - its centre of mass is not at the centre of its shape. Geologically, the reason for the offset of the centre of gravity is because the lightweight crust - or the outer layer of the Moon - is thicker on the far-side than it is on the near-side, while the inner layers, the mantle and the core, appear to be concentric like the stone in a peach. None of the texts I have consulted are outright explicit about this, but they seem to attribute this difference in crustal thickness to the gravitational influence of the Earth, potentially relating it to the fact that the Moon always presents the same face to us here on Earth, yet they seem to be remarkably reticent about coming straight out and saying it. But, how do we know that the crust is thinner on the near side ? 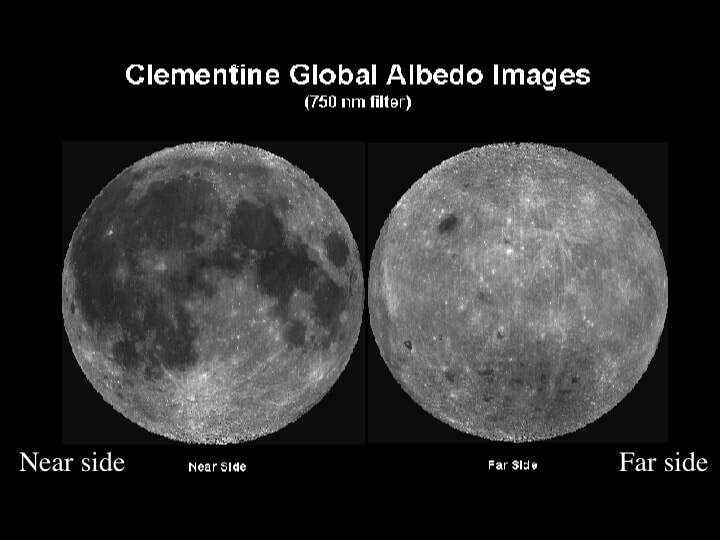 Well, when satellites such Lunar Orbiter and Clementine systematically orbited the Moon, the different crustal thicknesses influenced the Moon’s gravity field that tugged on the satellites as they passed over different parts of the lunar surface. By measuring the effects of gravity on the satellite orbits, planetary geologists can calculate models for the thickness distribution of the lunar crust and make maps, such as this one here. 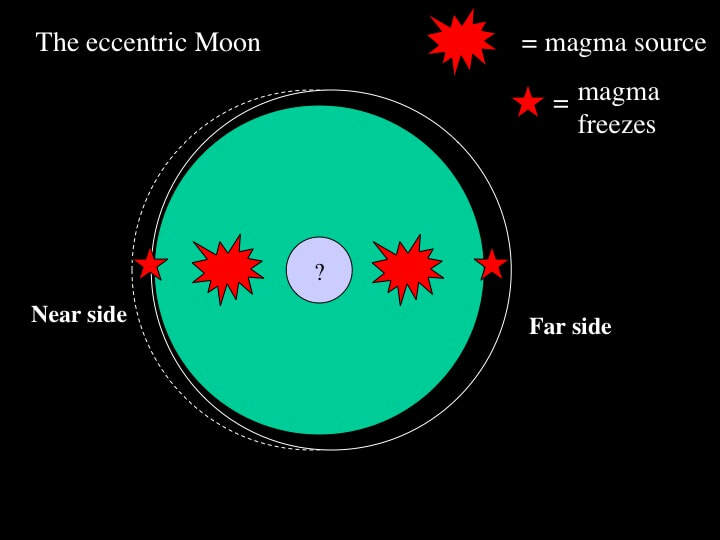 What all this means is that if a magma or lava is produced at a given level within the lunar interior (mantle), it has further to travel in order to reach the surface on the far-side, compared with the near-side. Lava cools as it rises, so there’s a greater chance that the lava will freeze before it gets to the surface on the far-side - therefore, there are more lunar mare on the near side ! ​Actually, its just a little more complicated than that. Bubbles and hot-air balloons rise because they are lighter than the stuff they are rising through - whether its air or water, cooking oil or custard ! 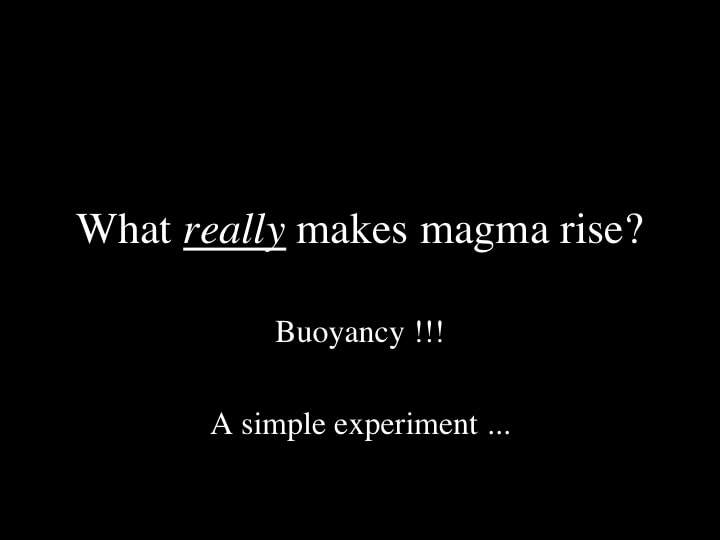 Well, in part lava rises for the same reason : because it’s lighter than the stuff it’s moving through - and the reason it’s lighter is because it’s hotter. The lunar crust is about 70 km thick on the far-side, and - this is the important bit - it is denser in the lower part and lighter in the upper part. When we say that the lunar crust is thinner on the near side, this means that much of the upper lighter part is missing, so lavas only have to rise through the lower, denser part to get very close to the surface. 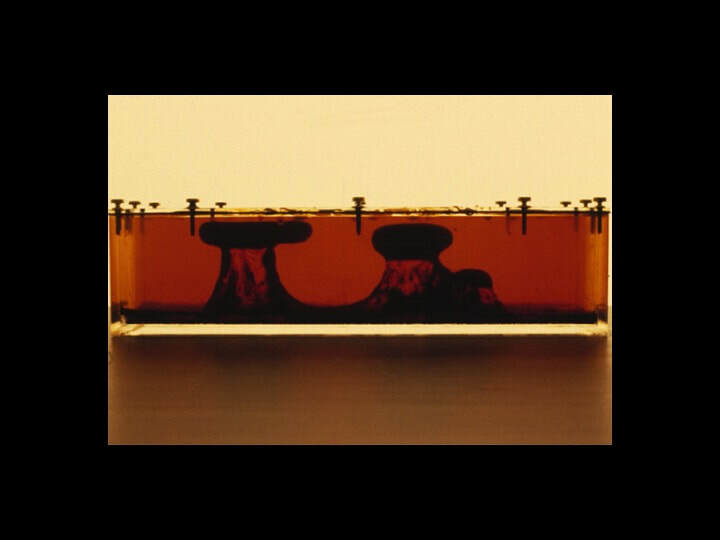 On the far-side, the same lava has to rise through a good thickness of light crust before it reaches the surface. If the lava is not hot enough, it will be too heavy to rise through light lunar crust, so it gets trapped in the middle of the crust where it freezes and stops moving. What all this means is that Mare lavas reached the surface of the Moon on the near-side much more easily than on the far-side​. I have to admit that this idea of light magma rising through dense lunar crust 3 billion years ago, when the crust was still warm enough to flow and make way for the rising lava, can be a bit awkward to take in without seeing it for yourselves. 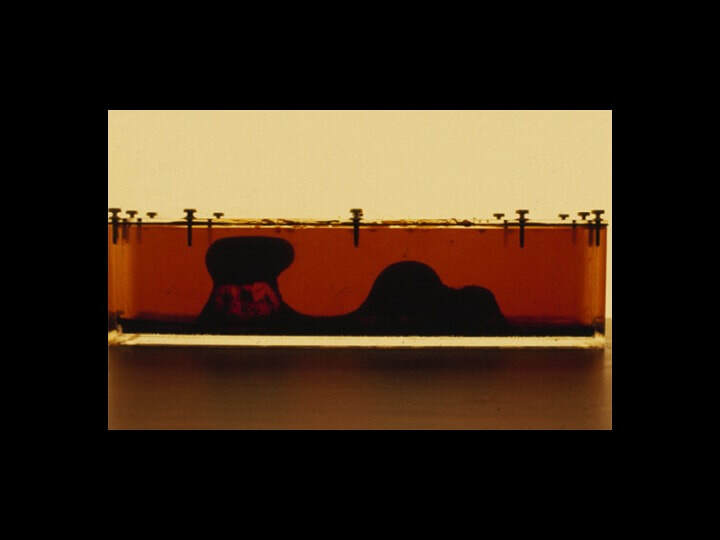 So I’ve put together a short animation made of everyday materials to simulate what I mean (the following images - in time sequence - were recorded during a 20-30 minute long lab experiment I put together while teaching Structural Geology at Carleton University in Ottawa). This image pretty well sums its up. Lava that has risen through the dense, lower part of the lunar crust, but gets trapped below the thick, light, upper crust on the far side of the Moon, while on the near side, the lava finds itself below a very thin upper crust that it can easily break through and flood the old impact basins. 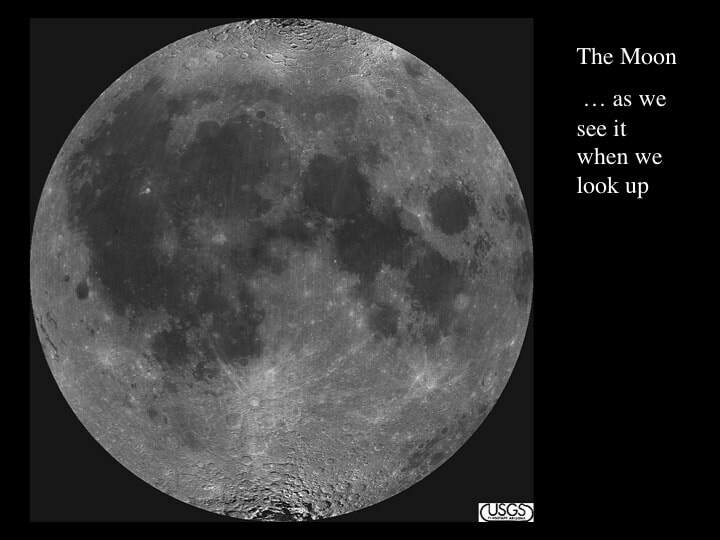 The Moon is almost as old as the Earth (~4.5 billion years!). It formed as a the result of an unimaginable collision between a body the size of Mars and the early Earth. It condensed from a ring system, similar in form to the rings of Saturn. 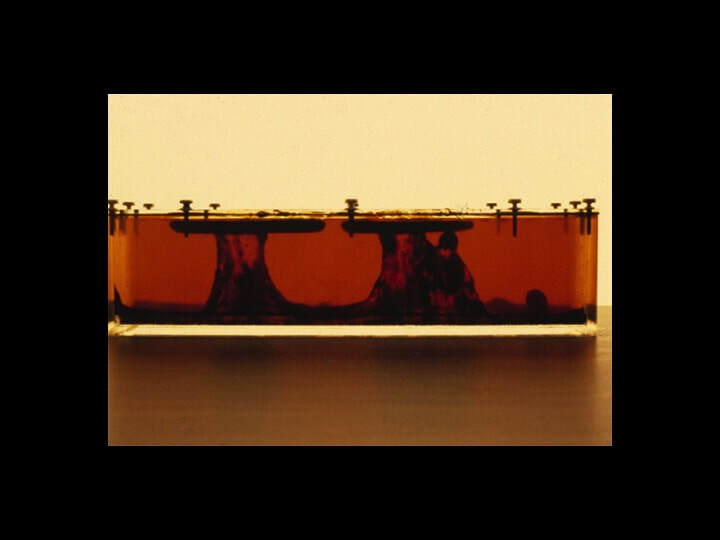 It developed asymmetrically, with two very different looking faces. 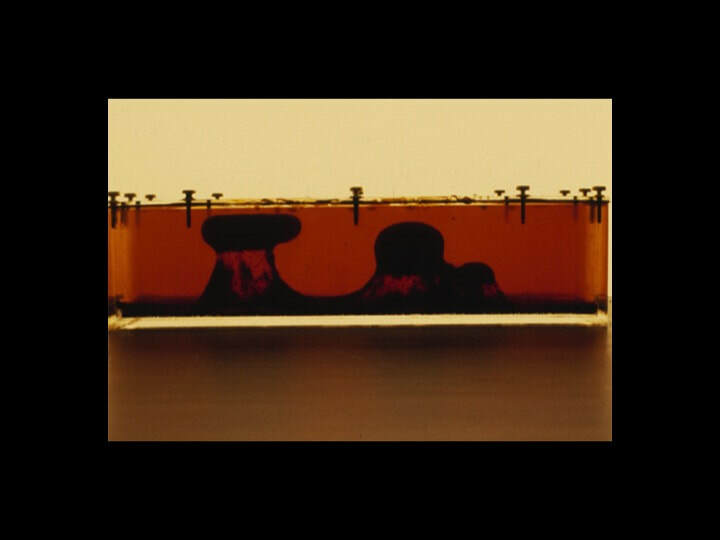 It’s crust is the result of light crystals floating to the top of a global magma ocean. After all that, impact cratering continued at a much slower rate. For example the impact crater Copernicus formed about 1 billion years ago, and Tycho “just” 100 m.y. ago.